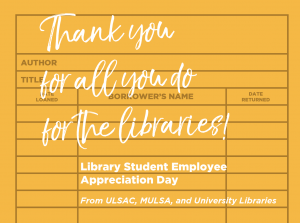 With sponsorship from ULSAC, MULSA, and the Libraries we are once again going to celebrate Library Student Employee Appreciation Day. The celebration will be Thursday, April 25th. There will be a cookie reception in the Ellis Staff Lounge from 2pm to 3:30pm that day. We encourage you to meet up with your students and come with them to partake in some cookies and let them know your appreciation for all that they do for us. We will also again be sending boxes of cookies to all of the specialized libraries and off-site locations so that you can celebrate with your students in your space. Supervisors, please forward the below invitation to your student employees. Please join the University Libraries Student Advisory Council (ULSAC), the MU Libraries Staff Association (MULSA), and the University Libraries in celebrating you, our wonderful student workers. We will be hosting a Reception featuring cookies for you on Thursday, April 25th from 2pm to 3:30pm in the Ellis Library Staff Lounge. Please drop in between classes for cookies and some conversation. We will also send cookies to each Specialty Library and off-site location for students who do not work in Ellis Library. The Libraries truly could not operate without our student workers! Thank you for all you do! Julie Housknecht has taken a position at a consortium of academic libraries in South Carolina and will be leaving the University Libraries. Her last day was May 15. If you missed our Instagram stories on the Mizzou Instagram feed during National Library Week, just go to the Libraries Instagram profile and click on the Library Week. If you haven’t heard, 52 Ellis Library has termites. They have infested the South wall from the east edge of Physical Processing all the way west to Digital Services’ area. There are two issues: killing the termites and repairing the damage to the wall. They will begin work on killing the termites on this Saturday and into early next week. As part of this process, they may use chemicals with an off-gas or foul smell.